Half an hour before midnight: my phone went, “there’s six lads trapped down Mossdale” my blood went cold; I had a feeling that they were not going to come out alive. 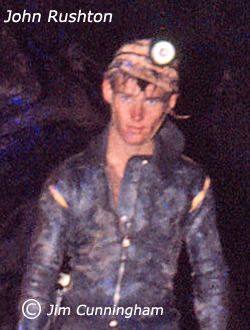 Techniques of caving have changed since Bob’s (Bob Leakey) day: wet suits, they could stand the cold and wet; they didn’t need to cover themselves in mud and lie there, they could cave for hours and hours. They loaded themselves up with lots and lots of provisions and lights, enough to last for several days and they forced that cave. They got to a point where they had passed where Leakey had been, when they came out, hours and hours after: when the rest of the caving world got to know, they were really heroes; heroes of the hour. Between them they worked weekend after weekend pushing this cave back and taking more and more risks. They were very fit, very hard lads, but I don’t think that they appreciated the dangers that they were creeping into. They even asked me the week before “why don’t you come with us Jim?” I said no, I said I am basically a coward, and that cave frightens me to death.” Oh you will be alright, if you know what you are doing; if you know what the weathers like, we’ve been down there that many times it will be alright, we will be alright” but (pause) I didn’t go. She went back to the cave and had a look again and to her horror, she couldn’t see the entrance to the cave, it was underwater, several foot of water covered the entrance and she panicked. And the rain kept coming, getting heavier and heavier and the beck kept rising; so she panicked and she ran, the terrified young lass ran two miles to a farm and raised the alarm and called out the cave rescue. They had a ten foot dam built and it was rocking with the force of the water. A farmer had lent us a tractor with a shovel on the front, and it was holding this dam back: it was moving. So they strengthened the dam and built another dam in front of it, and meanwhile all these lads were digging these trenches, they spent the whole night digging and diverting water before it was possible to get into the cave. Still dangerous but we could get into it. Mossdale caverns, a place I’ve avoided all my life (pause) and here I was on a rescue in a cave that was in imminent danger of being flooded to the roof, I was full of apprehension. So I thought “could he have got to a high level place” you don’t give up on a cave rescue. So another team went down, a fresh team, they couldn’t find him, there was just five bodies (long pause) they didn’t find John Ogden for two days. Then Brian Boardman went down on the Wednesday, I think, for a final look. He crawled over the bodies and he saw a pair of boots and a helmet: it was John Ogden. He had been washed up a crack, so that was that. It was out of the question to try to bring these people out, to work in those conditions in a tight cave like that. The Coroner decided that it would be right and proper to leave these bodies in there and seal the cave. ABOUT THE RESCUERS: "WHAT A FINE BUNCH OF PEOPLE"
Looking at that scene that night, over two hundred cavers some stripped to the waist, all working like fury to save their mates, I thought “what a fine bunch of people, if I had have been down there stuck, they would have been doing the same for me”. They don’t curse the fact that these lads went down when the weather was bad, they shouldn’t have gone down they gave all to save them, I think that they are a great bunch of people. I do remember that Tony (Waltham) was just in front of Jim Eyre, myself and several others and reported to us that he had found a body. He then used the radio to report that he had found a body and was told to come out immediately because it had started raining again. I remember crawling through the debris of the cavers belongings that had been washed off the bodies but after the radio instructions, I left with Tony, Jim and the rest of the group. I do not know Frank Rayner but maybe you will recognise him in the group photo. In order to save up for the forthcoming Berger expedition, I had decided to work overtime that weekend. I was installing railway lines at York Railway station. On reflection, it was probably a good decision. Had I not been working, I would probably have taken part in the Mossdale trip myself. It was only at breakfast time on the Monday, when I saw the headlines in the morning papers, that I realised there had been an accident. I drove up to Braida Garth and found out the state of play from the guys who had returned from Mossdale. I gathered my caving gear and proceeded to the cave entrance. At that time, five of the six bodies had been found and were named as Dave Adamson, Geoff Boireau, Michael Ryan, Bill Frakes and John Ogden. The sixth Colin Vickers, as it was thought at the time, had not yet been discovered. The coroner had decided that as only five of the six had been found, the next party down had to either discover the sixth body or positively identify the five. As the deceased was made up of cavers from different clubs, the search party must also consist of cavers from those clubs in order to carry out the identification. I was chosen as a member of the Wanderers. From memory there were six cavers who descended, led by Dave Brook. His is the only one I can remember and that is the only time I have ever been underground with Dave. When we reached the junction of Leakey's Marathon (Far Marathon West) and Far Marathon East we split into two parties of three. I was in the party with Alan Brook who proceeded through Far Marathon East. It was in here we discovered the first body. This was identified by the others as Geoff Boireau. We carried on and after the two passages came back together we were rejoined by the other three cavers. On the return journey through Far Marathon East we discovered the other bodies and began to make a positive identification. On carrying out the identification process, I discovered that the body previously named as John Ogden was, in fact, Colin Vickers. They were of a similar stature. 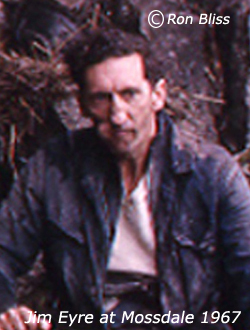 I also identified Bill Frakes. Michael Ryan and Dave Adamson were identified by others in the party. We attempted to find the sixth body (John Ogden) but without success. We returned to the surface to report our findings. I never entered the cave again and John Ogden's body was discovered sometime over the next couple of days.